Father today, As we have just started the new year , I thank you for mercy and grace that has been guiding us as you have been declared king in our lives and you reign supreme, I glorify your blessed name for the achievements so far this year. I magnify your name for what you have began in the Light of Christ ministry, what you are doing and what you will continue to do through the power of the holy spirit, I pray today That through the power that rest with you as our kings of kings and the lords of lords, during and after this sermon you will begin to set us free from all shackles of Satan, we will become accomplish spirit filled Christians living in peace, living in the joy of your grace in the mighty name of Jesus I have prayed. Are you a Christian who is being persecuted? Be comforted by the fact that Christ reigns. Suffering affliction from unconverted family members? Be comforted by the fact that Christ reigns. Enduring physical ailments that leave you miserable? Be comforted by the fact that Christ reigns. Facing an obstacle in your life that seems insurmountable? Christ reigns. Perhaps you are discouraged. I tell you that Christ reigns. Perhaps you feel weak and impotent in the face of temptations and trials. On the authority of God’s Word, I remind you that Christ reigns. All praise to Him Who reigns above, in majesty supreme. Why did Joseph persevere in prison, knowing that he had done no wrong? Why did Daniel continue to pray as at other times, knowing that it might cost him his life? Why did the three Hebrews refuse to bow down to the idols, when faced with the fiery furnace? How could Paul and Silas have rejoiced after being beaten and imprisoned in Philippi? A Do the kings of this earth have their royal clothes? Well, my king is said to be “clothed with majesty.” But what is majesty? Majesty is defined as stately dignity and as imposing character. It is supreme greatness and sovereignty. And the Lord Jesus Christ is clothed with it. Simon Peter once wrote that the apostles were “eyewitnesses of his majesty. And in Job 37.22, he tells us that “with God is terrible majesty.” Terrible majesty is majesty that inspires terror, that overwhelms with awe, that fills with fear, that leaves one with astonishment, and that staggers the comprehension of the lowly creature. Who can compare to our King in His glory? Who is to be esteemed next to His excellent greatness? Who else is worthy to bow before? It is at His name that every knee is bent, every head is bowed, and every tongue confesses that He is Lord to the glory of God the Father. 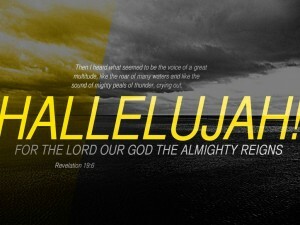 The Lord Jesus Christ does, indeed, reign . . . gloriously. The psalmist continues in verse one with these words: “the LORD is clothed with strength.” He is not only clothed with majesty, as a prince in his court, but He is clothed with strength, as a general in his camp. By this, we understand that He has the wherewithal to support His greatness and to make it truly formidable. See Him not only clad in the robes of royalty, but also clad in the armour of conquest. Both strength and honour are His clothing. This shows us that He can do everything, and that with Him nothing is impossible. We are told that with this strength “he hath girded himself.” This means that His strength is not derived from anyone else. Nor does the exercise of His strength depend upon anyone else. He has His strength of Himself, and does with it whatsoever He pleases. Therefore, let us not fear the power of man, which is both borrowed and limited, but let us fear Him Who has power to kill and to cast into Hell. Job says the same thing, but in a poetic fashion, in Job 23.7: “He stretcheth out the north over the empty place, and hangeth the earth upon nothing.” This is a verse that says more about the maintenance of the existing order than its creation. So, what we observe to be the preserving of the powers and course of nature is actually what the Lord Jesus Christ ought to be glorified for doing. And we who benefit from His nature each and every day are very careless and ungrateful if we fail to give Him the glory that is due Him for it all. His is a title without a flaw or defect. His is a title that is ancient. His is a title that is established of old, from the beginning of time, before any other rule, principality, or power was erected. He truly is the king of all glory, the King of kings, and the Lord of lords. Does the Lord Jesus Christ reign eternally? Listen to Paul’s words to Timothy, in First Timothy 6.15-16, to make up your mind for you. He describes his Lord Jesus to young Timothy as “the blessed and only Potentate, the King of kings, and Lord of lords; Who only hath immortality, dwelling in the light which no man can approach unto; whom no man hath seen, nor can see: to whom be honour and power everlasting. Amen.” If He is the blessed and only Potentate, if He is the King of kings, and Lord of lords, and if He only has immortality, then it is very safe to say that He does, indeed, reign . . . eternally. Amen? A potentate is a person so powerful they don’t have to follow the rules that govern everyone else. Potentate normally refers to a king or dictator, but you can call anyone with virtually unlimited power a potentate. A . The imagery in this portion of the poem is of a threatening storm. “The floods have lifted up, O LORD, the floods have lifted up their voice.” This speaks of terror. “The floods lift up their waves.” This is worse, for this speaks of real danger. The allusion is of a tempestuous sea. Yet Isaiah 57.20 compares the wicked to such a scene: “But the wicked are like the troubled sea, when it cannot rest, whose waters cast up mire and dirt.” So the psalmist has created a scene in which wicked men terrorize and frighten the child of God. B But do wicked men actually behave this way? Psalm 2.1 indicates that the heathen rage, so, yes, they do behave this way. Isaiah 54.11 shows that God’s people are sometimes “afflicted, tossed with tempest, and not comforted.” And in Psalm 18.4, the psalmist admitted “the floods of ungodly men made me afraid.” So you see, any child of God can be overwhelmed with doubts, with fears, with circumstances, both by enemies and by the weaknesses of the flesh. Praise be to God, then, that the Lord Jesus Christ, Who once walked on the rough waters and quieted the wind, is still able to calm the stormy seas. Notice what Psalm 93.4 tells us about our sea anchor, Who provides stability during times of distress: “The LORD on high is mightier than the noise of many waters, yea, than the mighty waves of the sea.” He is mightier, and does more wondrous things, than the noise of many waters. Short prayer against enemies. Let the heavens shake against my enemies. Let the earth shake against my enemies, let the dry land shake against my enemies, let the seas shake against my enemies. Our Lord was once asleep on a pillow in a little boat during a violent storm. When His disciples were overcome with fear they woke Him and said, “Master, carest thou not that we perish?” Then “he arose, and rebuked the wind, and said unto the sea, Peace, be still. And the wind ceased, and there was a great calm.” If He can calm the wind and the waves, can He not calm your heart and mind? If He can rule over nature triumphantly, and over all His enemies triumphantly, can He not deal with your enemies and circumstances triumphantly? The answer, of course, is yes. You can rely on His word. So, what should your response to His trustworthiness be? He promises safety and keeps His promises. He says you are secure from harm. So, what should your response be? The psalmist puts the proper words into our mouths: “Holiness becometh thy house, O LORD, for ever.” This is a reference to Christ’s household, so I will apply it to both this church and the household of faith. Whether you are a member of this church or a Christian who is our guest this morning, this church and the household of faith at large can be likened to God’s house. It is cleansed from sin, consecrated by God, and it should be employed in His service. The holiness of this church is our beauty (saints are never so attractive than when conforming to the image of Christ). My friends, it is the holiness of this church that secures her against the many waters of our enemies and their sometimes frightening noise. But no matter the noise, where there is purity there will be peace. Fashions change, and that which is popular at one point in history is not so at another time. But holiness always reflects well on Christ’s church, and those who are members. Let other churches follow this fad and then that fad. Let other Christians be blown by one wind of doctrine and then another. Our response to Christ’s glorious, powerful, eternal, triumphant reign will be holiness. 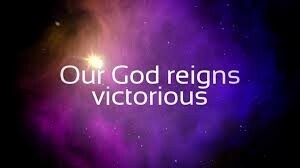 If God reigns, does he reign in your life? 2kings 18:5 — He trusted in the LORD God of Israel; so that after him was none like him among all the kings of Judah, nor any that were before him. Anointing for constant open heavens, fall on me now, in the name of Jesus. Powers ordained by heaven to make me great, arise and locate me, in the name of Jesus. My life, hear the word of the Lord, become an undeniable proof that there is a God in Israel, in the name of Jesus. God arise and use me as a divine showroom to display power and prosperity, in the name of Jesus. C : If he reigns in your life, the enemies will be defeated. Psalm 93:4 The LORD on high is mightier than the noise of many waters,yea, than the mighty waves of the sea. No matter how powerful your enemies are, the lord who is the king of king is capable and able to deliver you. Satan heated the furnace seven fold to kill Shadrach, Meshak and Abednego. But our Lord descended into the fire with a greater power, walked with them and saved them. Whenever satan rises against you mightily, remember that the anointing of the Lord will descend on you in a more powerful way. Prayer to accompany benefit : EVERY power assigned to prolong your problems, may the ground open up and swallow them in the MIGHTY name of Jesus! Ni pa Agbara ti be ninu Jesu christi, Gbo Irinse Esu to di Ogo wa lowo, ti koje ki ani aseyori ni oga Ogo a baje patapata Loni.